On Weekdays we operate as a mixed billing practice. Patients under the age of 16, as well as Pension/Health Care Card holders and Full-time students with valid ID will be bulk-billed if booked in for an appointment. All other consultations will be privately charged, and with a valid Medicare card we can claim your rebate for you electronically without hassle. We also take walk-in patients, however please note that these will be privately charged consistently even if the patient is a child under 16,holds a Pension/Health Care Card or is a full-time student. We also cannot guarantee a short wait time for these consultations. We are a fully private billing practice on weekends and public holidays. A reduced gap fee is charged for children under 16, pension and concession card holders’ consultations. Please note that consultations on Sundays or Public Holidays will attract a higher fee to the usual schedule as these are considered after-hours consultations. 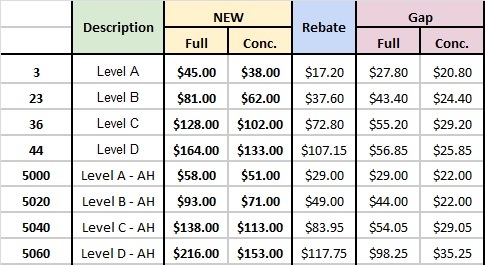 The table below shows our current prices. A complete fee list can be provided on request. *Medicare rebates are an estimate, please be aware this may vary. Please note a Non-Attendance Fee of $20 is payable if a patient does not attend their doctors appointment or if the appointment is cancelled with less than one hours notice. If a patient fails to give 48hours notice or does not attend an allied health appointment, a Non-Attendance Fee of 50% of the consult fee will need to be paid. Travel vaccines will incur a private fee also for the purchase of the vaccine as they are not covered by Medicare. Private Billing applies to all Women’s Health Checks (Pap Smears). There will be an out of pocket gap fee of $29.20. For contraceptive procedures involving hormone implants, there will be an out of pocket fee of $80-$100. Why do we charge a fee for medical services? At Glebe Medical Centre the quality care that you receive is a product of the dedication and expertise of our staff and a modern, well-equipped facility. Current and previous governments have failed to regularly increase the Medicare rebates. This means Medicare rebates have never kept pace with the cost of living and have never covered the true cost of delivering quality medical care. This charge ensures Glebe Medical Centre can continue to provide you and your family with high quality healthcare whilst also covering the ever increasing costs of running a business in Sydney especially while under a Medicare freeze environment. Glebe Medical Centre has chosen to continue to subsidise your healthcare by setting our fees lower than the current recommended fee schedule set by the Medical Association of Australia (AMA). Glebe Medical Centre provides Medicare Ezyclaim for all rebates. Funds are directly deposited back onto your debit card instantly. Please enquire at reception for more information.